We know there was a church in Henham in Saxon times. In the reign of Edward the Confessor the manor was held by Thurston, a great thegn and warrior, who left in his will of 1044 or 1045 some of the land to the church, and the rest of the manor to his wife Ailgith. At the Conquest the manor and her other estates went to Ralph Baynard, one of the Conqueror’s attendants. Ralph’s descendant, William, forfeited his estates in the reign of Henry I, and Henham passed to the FitzGilberts, the FitzRoberts, and ultimately to the FitzWalters. These great Norman barons were responsible for appointing rectors up to 1234, when Walter FitzWalter gave the living to the Priory of Little Dunmow, and a vicarage was instituted. After the Reformation, Henry V111 gave the living to Robert Ratcliffe, Earl of Sussex, from whom it passed to many various patrons. The living is now held by the Church Society. 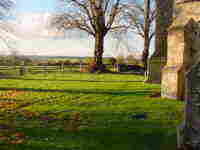 Stand outside the porch, built in the late 15th century, and look across the fields to the north-west, where the manor house of the FitzWalters and the Earls of Sussex once stood. You can see the line of the moat, bordered with trees, which has been unaltered since those days. A little bit of 12th century Norman shingle work built into the south side of the tower is a link with the church’s earliest times. On either side of the outer porch are two small shields - that on the eastern side is of the FitzWalters. The medieval carvings of masks and foliage on the porch roof deserve study. On entering the church you will notice the pillars on the north side are shorter than those on the south. Originally the most eastern arch on the south side opened into a transept. Unfold for yourself a picture of the church as it was in the thirteenth century - a church with a nave of the same size as the one we see, but with solid walls and no aisles; no screen before you, and a dark chancel lit by small windows; a transept on the south side, which was pulled down about 1300, to be replaced by the present south arcade and wall. About twenty-five years later the north arcade and aisle were built, and the beautiful group of two angels censing the Virgin and Child carved on the capital of the second column. Other interesting carvings are the face of a laughing devil on the reverse side of the second column, and a dragon with a knotted tail on the fourth column. The Black Death closed down on Henham in 1348, and no more important work was done for many years. The chancel arch and all the chancel windows, with the exception of the three 13th century lancets, are late 15th century. The East window incorporates a very fine shield of the Trinity; this, like the fragments of old glass in the western window of the north wall, is 15th century. The heraldic glass in the eastern window of the south wall, commemorating the FitzWalters and their marriages, is late 16th century. The Lord’s Table, in memory of Agnes Marshall Pimblett, was made by a Henham craftsman in 1952. The piscina, where the sacred vessels were washed, is late 15th century ; the recess or cupboard on the north wall may have stored the altar vessels, or been connected with the services of the Easter Sepulchre. Wall paintings of the apostles may have originally stretched right round the chancel: traces can still be seen, as well as a fragment of wall painting near the Feake Memorial, possibly illustrating the tablecloth used at the Last Supper; this was uncovered in 1946. Near the 13th century doorway is an effigy of Thomas Kirbye, 1603. in white marble inlaid on slate; he is wearing an old-fashioned cloak for that period and a pair of tight modern Spanish breeches; he turns his leg sideways so you can admire the gusset and clock on his stocking. This effigy was covered by choir stalls for many years until the chancel was restored in 1952. At the same time the Laudian altar-rails were replaced. Medieval churches in Essex are frequently inhabited by a mysterious carving of an ancient male head often surrounded by foliage. The earliest types of similar decoration was found in Roman temples. The Christians seem to have adopted this symbol. Henham is no different, there is the Green Man hides within the roood screen gate in amongst a multitude of decorative foliage. If you are interested in the other Green Men in Essex Susan Hegedus has written a book called The Hidden Green Man in Essex. The screen is late 15th century, carved with foliage and grotesque heads. The little rood-loft staircase, at one time blocked by the organ, was opened up in 1952. On the centre arch of the screen and on either side of the four side lights can be seen where the supports have been cut off which carried the traceried vault of the rood-loft, on which must have stood the Rood or Cross, with the attendant figures of St. Mary and St. John. The pulpit dates from the 15th century , with a 17th century bookrest. 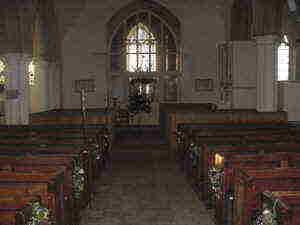 In 1890 the three-decker arrangement of pulpit, desk and clerk’s desk was still in existence, and the high post-reformation pews still remained with their doors and fastenings. The old deal pews and lamp-brackets are still in the side aisles. The lectern is Jacobean with guilloche ornament. 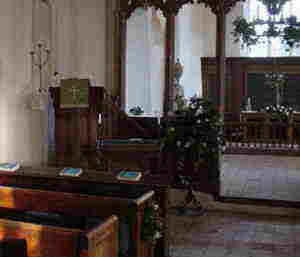 It was used as a desk in the chancel until 1952, when it was repaired as a lectern. This was built about 1325, at the same time as the north arcade. It contains five bells, four of which are inscribed. Ist Miles Graie fecit 1636. 2nd Milo Graie me fecit 1641, 3rd Sit nomen Domini Benedictum T.H. 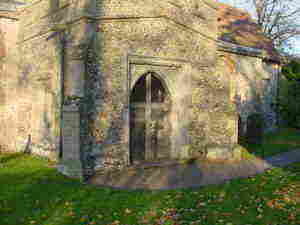 (indicating that it was the work of the 15th century bell-founder, Thomas Harrys). 4th T. Mears of London fecit 1828. This last bell also bears the inscription -Revd. G. H. Glynn, Vicar. John Mumford, Wm. Stallibrass, Church Wardens. Since 1958 the fifth bell (uninscribed) has been the only one still hung for tolling. Since the first publication of this pamphlet in the 1960s, many important discoveries and events have taken place. In 1975 part of a Norman arcading was uncovered on the exterior of the east end. In 1985 the ancient bells were re-cast with a ring of six, due to a bequest from Jane Marshall. This is a House where Prayer has been made to God for over 800 years. Kneel therefore before you leave, and say a prayer for the Church, this village and yourself.